I’ve been documenting my kitchen table over at MWp52. I attempted last year, and really regret not finishing. So despite the busier year, I’m sticking with it. I thought I’ve give a little back story and update. This year, my kitchen is not the prettiest, most comfortable place to be. The floor separated from the subfloor, creating a big bubble when we walked by the refrigerator. We suspected a leaky dishwasher. Removing the dishwasher revealed black mold. 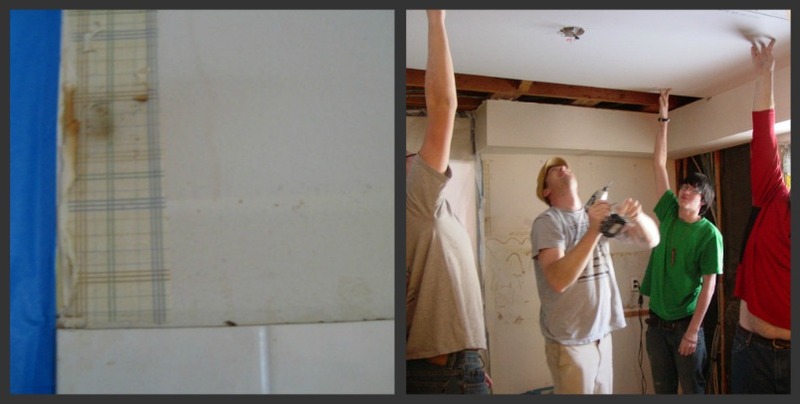 Removing the mold and dry wall, we found evidence of past patch jobs. not pretty behind the dishwasher. not at all. The cabinets and ceiling came down, giving us a nice view of all the plumbing in the house. More drywall came down. Our neighbor the plumber inspected and replaced the drain for the master bathroom before we ceiled things up again. The new pipes were unrelated to the kitchen, except that the bathroom floors are the kitchen ceiling. But then, during someone’s shower in the kid bathroom, also upstairs, we hear and see water leaking down into the kitchen. The bathtub surround and drywall in the kid bathroom came down. More black mold. We thought we were just replacing a dishwasher and counter. Right now, everything along two walls of the kitchen is gone. Everything around the bathtub upstairs is gone. Found some old wallpaper. Groovy, eh? Tell me about your house’s remodeling and repair work. This entry was posted in etc., photography and tagged kitchen, p52. Bookmark the permalink.